Satellite campuses a trend of the future? Isaac Miao communicates with most of his class at the push of a button. He and his classmates are the first group of medical students to study at Dalhousie’s Saint John campus. Their lectures are video-conferenced, and students from each campus must activate personal microphones when speaking so their voices can be heard on the other end. But other than that, they are one class. Due to improvements in technology, Miao says a Dal Medical School education feels entirely accessible from New Brunswick. Miao’s class is set to do theirs next semester. This, in itself, is nothing new; Dal students have done clerkships in New Brunswick before. However, DMNB students can only leave the province for this part of their studies if a Nova Scotia student fills their spot, almost like an exchange. Because that’s not expected to happen often, there will likely be more future doctors spending more time in the province. There are other benefits to distributed programs as well. Some communities do not have the size to sustain a medical school. The Northern Ontario School of Medicine, for example, was founded in 2005 and has many small campuses and teaching centers throughout the expansive, yet scarcely populated, northern Ontario region. New technology has made such satellite campuses possible. 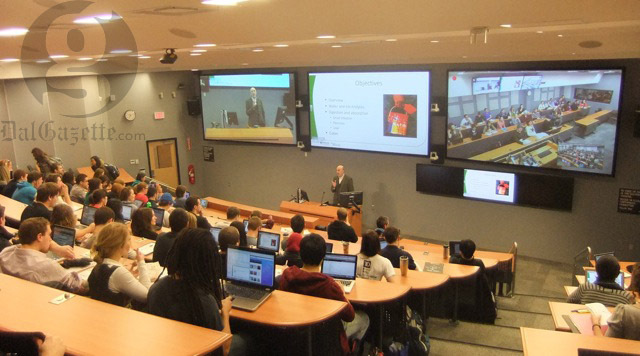 Inside Dal’s lecture hall in Halifax, three high-definition screens show the lecturer, his/her PowerPoint presentation and the other campus’ classroom. When a student at either location has a question, he or she presses a button at their desk, which notifies the lecturer via a screen built into the podium. A microphone in front of the person speaking is activated, and a camera automatically zooms into the student so that those in the other classroom can see and hear the question asked. If the lecturer paces, his respective screen shows a wide shot of the room. 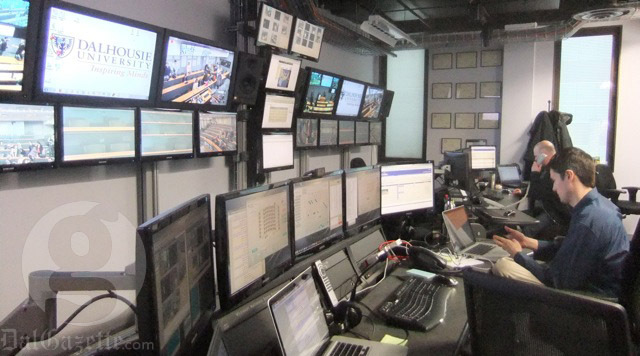 Technicians coordinate these components from a control room next to the lecture hall. The system cost $5 million, and the New Brunswick location has most of the same features. Thomas Marrie, the dean of Dal’s faculty of medicine, says the idea of a satellite campus hovered many years before it was actually implemented. “The people of New Brunswick, or at least a small group of them, have for some time wanted to have a medical campus in New Brunswick,” he says. In the 1950s, there was even consideration given to starting a medical school in the province. Marrie says the overall goal was always to have no differences in academic content if students study from a satellite campus. “Twenty years ago,” he says, “it was probably not possible, but now it is.” While Marrie is unaware of any new major satellite campuses being planned, the success of DMNB leads him to believe this is a trend. Isaac agrees. He says the campus is not the first of its kind in Canada, and “definitely not the last.” For him, the available technology makes all the difference in terms of accessibility.